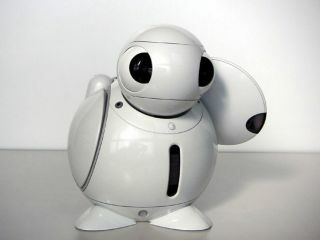 Now that it doesn't have to bother with that pesky old HD DVD business, Toshiba has turned its hand back to domestic robotics and come up with a cutesy little number that is just aching to be our slave. The company's ApriPoko robot [Japanese] is the latest iteration of a more complex 2002 prototype called ApriAlpha that was designed to perform all manner of home chores. This 'droid is charged with the more simple task of ministering to his master's televisual needs through the wonder of voice recognition. The 2.3kg, 27cm-tall ApriPoko is essentially a souped-up learning remote that can absorb the functions of an entire household's infrared handsets and beam the same signals out of Ir ports in its arms. Teaching it is a simple matter of pointing each remote, pressing all the buttons and telling the machine what's going on. A camera in its head also enables it to recognise each user and their preferences. After that, Toshiba says ApriPoko will respond to cries such as "Oi you - gimme channel 28 on the Freeview box now, or else." What more could one ask for? Although Apripoko is still just a prototype, Toshiba is looking to commercialise it before too long. Only in Japan, of course.